After fouling out of the game against Brown, Brendan Barry ’20 scored nine points in Dartmouth’s 89-68 loss to Yale. 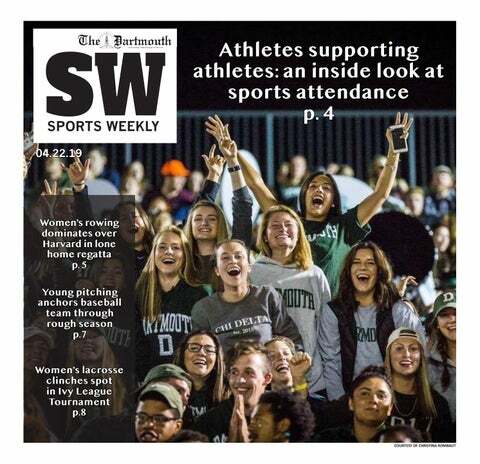 After a strong non-conference run and a convincing victory over Ivy League powerhouse Harvard University, who is now 3-1 in the conference, everything appeared to be going Dartmouth’s way. A close loss in Cambridge evened up its conference record at 1-1, but this weekend appeared to be a way for the team to get back on track. For much of the Brown game on Friday night, it seemed that the Big Green would secure its second Ivy League victory and regain its winning conference record. The team jumped out to a 7-0 lead in the first few minutes and led for most of the first half. While it entered halftime trailing 27-23, a strong second half effort gave the Big Green a 53-46 lead with fewer than four minutes remaining. However, the Bears came back furiously in the final few minutes, sinking a pair of triples before a Tamenang Choh layup gave the Bears a one-point lead. To make matters worse, two of Dartmouth’s top scorers, Brendan Barry ’20 and James Foye ’20, fouled out in the final few minutes. While Foye didn’t foul out until the final minute, Barry’s night came to an abrupt close when he was tacked with his fifth foul with 4:44 left, putting the Big Green at a key offensive disadvantage in crunch time. Brown never trailed after Choh’s clutch layup, although the Big Green made some crucial free throws late in the game to stay in contention. Then, after a missed Brown free throw and the Big Green down by two, Guilien Smith ’19 raced up the court in the final seconds and pulled up for a relatively uncontested three-pointer that barely rimmed out. The close loss was especially frustrating because the offense didn’t perform up to its usual standards in a couple of key categories. For starters, it turned the ball over 20 times, a season high by a wide margin. This contributed to Brown taking 11 more shots than Dartmouth on the game, which made the difference. Second, it only knocked down five of 20 three-pointers, a clip of 25 percent that’s far lower than its season average of around 40 percent. On a more positive note, the team had a strong overall defensive performance, even if it faltered in the last few minutes. Holding Brown to a mere 60 points was especially impressive given that the Bears hadn’t scored fewer than 60 points in a game since Dec. 5. Even more incredible was holding the team’s leading scorer in Desmond Cambridge to four measly points , his lowest point total all season. Unfortunately, the same could not be said about the team’s blowout loss Saturday night to offensive juggernaut Yale. The Bulldogs put up 89 points on the day, 31 of which came from standout Miye Oni. Oni, arguably the best player Dartmouth has faced this season, had his best game of the season, scoring 24 in the second half and finishing the game with three thunderous dunks. Offensively, there were some bright spots in the team’s highest-scoring game since the first Harvard game. The Big Green only turned the ball over nine times, a significant improvement from the Brown game and a performance that’s more characteristic of the team’s true abilities. Additionally, while Brown double-teamed leading scorer Chris Knight ’21, Yale relied more on one-on-one matchups. As a result, Knight had one of his better performances on the season, tallying 20 points, his second-highest on the season, in addition to eight rebounds. Jackson also had one of his best offensive performances of the season, providing the team with 18 points. While Knight and Jackson put up solid performances, the team’s perimeter shooting was downright bad for the second straight game. The team that has spent most of the season as a top 10 3-point shooting team in the NCAA shot a lackluster 23.8 percent from 3-point range. Yale certainly made a deliberate effort to prevent the team’s trio of guards in Barry, Foye and Sistare from getting open looks. The three combined for just seven three-point attempts, whereas Jackson, a forward, took seven alone. While this weekend’s homestand was disappointing, the team has a chance to avenge itself back at Leede Arena next weekend. Dartmouth will take on Cornell University next Friday night and Columbia University on Saturday, both of which are very winnable games for the team. While the team’s 1-3 conference record isn’t what it was hoping for, a sweep next weekend would vault it right back into contention at 3-3 in the conference.